Hip resurfacing is still a great option when you are a good candidate. There are very few problems with hip resurfacing for most people. There are always a few who do, unfortunately, have problems. Fortunately, there are not many. I had a bilateral done on 29th of April this year Dr DeSmet. After 8 years of suffering I finally got through all the issues of Back pain (2 replacement disc’s) knees issues and numb feet issues and yes burning left hip and weak flexion on the right side (limping) The recent surgery has at this stage only 3 weeks after the surgery changed or fixed 90% of all of that and I can sleep. I am almost off pain killers and have the left leg to sort out right leg seems real good. These get hit rather hard when they get dislocated for surgery. Just want to thank everyone involved in my Hip replacement at Anca Medical center. I had high expectations of fast recovery but this is incredible. To try walking with crutches the day after the operation and be able to walk in the city of Gent 4 days after operation was amazing. Today its 8 days since operation and I can walk without crutches. 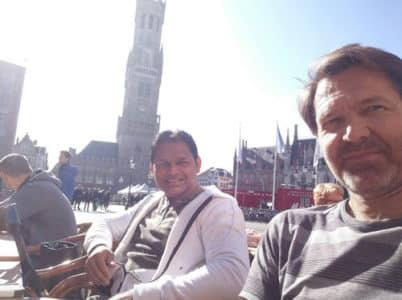 Yesterday me and my new friends took a day tour to Brugge as walking training. I still use crutches for balance. So far, all my pain of 2.5 years is gone! Absolutely incredible! I am so happy to have found your resourceful website and Bless you for your efforts – you have saved many thousands of lives that would have been cut short by premature THR procedures. Arthritis is not nice stuff and I have many family member given their opinion of my health and lost many friend over what has happened due also to their opinion.